This special set is a donation for the raffle which will be organized at Blythecon Europe. Bouton d'Or includes a double breasted buttercup wool coat featuring multicoloured flower buttons, a wool crocheted hat as well as a flower hair or hat pin. 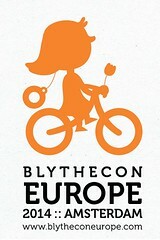 More info about the event on the official Blythecon Europe page !